This nudi is from a dive in Lembeh strait on the NE corner of Sulawesi in Indonesia. This area is well known for the huge variety of critters found on the dive sites, they are not clean coral reefs but rather black sand and rubble bottoms and there is a huge range of marine life found there. Olympus OM-D EM-1 MkII +60mm macro, INON strobes, Nauticam housing. 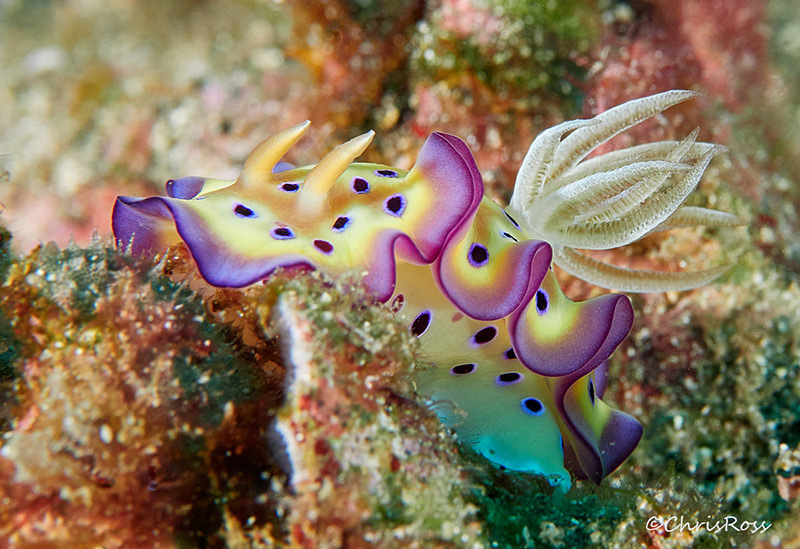 Super image - love the nudibranch colors and patterns. Really like the DOF on this one, get to see the gills and rhinophores (the "horns") tack sharp. Great color. I don't know much about marine animals, but I can tell this an incredible image! Great colors, very good dof getting the entire animal in focus. Excellent capture! Absolutely stunning! You a true master of this very specialized art. I can't get enough of these wonderful Nudis with their amazing forms and colours! This is a superb capture, Chris. VERY well done! The flamboyant colors found in nature, on full display, captured beautifully.